Doctor Ambrosio has led an active lifestyle since he was young. In high school, he was always training and involved in martial arts competitions. At one point he started to feel stabbing pain and numbness from his low back down to his left foot. It continued all day long and nothing worked to relieve the pain. He learned about chiropractic from a neighbor and decided that even if he did not know what it was, it was worth a try. During his chiropractic examination, Dr. Ambrosio knew that chiropractic was exactly what he was looking for to help with his sciatica, and in what he wanted to do with his life. It made perfect sense to him, since he had incorporated nutrition and fitness into his life at a young age. He was always looking for a natural way to stay healthy and feel better. The results that he got from being adjusted was exactly what he was looking for. After a month or two of chiropractic adjustments, Dr. Ambrosio’s allergies just disappeared. He was used to sneezing dozens of times per day and taking allergy medication since he was a small child, but he no longer needed it. Not only did his back pain go away but so did his allergies. This confirmed that chiropractic was what he wanted to do with his life to stay healthy and to help others achieve the same results. Dr. Ambrosio attended Life University in Marietta, GA to complete his chiropractic education. His best friend had started attending Life University about a year and a half before him. Since Dr. Ambrosio was a flight instructor at the time, he would fly down, visit his friend and check out the college. Seeing what Life University had to offer was the deciding factor as to why he chose this college to pursue his chiropractic degree. 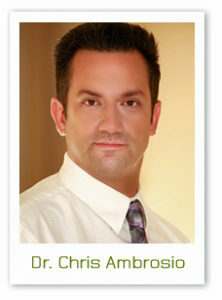 Dr. Chris Ambrosio is a chiropractic physician, kinesiologist and a published author. In addition, he is also certified in many advanced therapies. He is diligent in learning about new techniques and therapies to help his patients, family and friends. He has two books on chiropractic care, detoxification, exercise and nutrition. Dr. Ambrosio is known for his successful outcomes. He uses a “whole person approach” when taking care of his patients. By combining the very best hands-on techniques, state of the art physiotherapy procedures, and providing the best organic supplements on the market today, he is able to help you accelerate and/or maintain your journey to great health. When he is not seeing patients, Dr. Ambrosio and his wife stay busy with their young son. They are active in their church and are focused on their family and friends. They enjoy traveling, hiking, and being in the outdoors. Dr. Ambrosio is an advocate for the poor and the hungry and supports Food for the Poor. Even when you are not sure if there’s hope for you, we are here to offer it. Give our office a call today to find out how we can help you.